I’m not a particularly optimistic person (understatement of the year). Depression hasn’t helped. But I’m trying out this idea of allowing the dark times to teach me about myself and also about God. I’ve written about how I believe that God uses our depression to teach us about our hearts and how we should use depression as a tool to examine what we worship. I’ve also written about how even though Edward Welch’s book on depression argues that suffering should bring us closer to God – because our world is broken and we are broken, often the opposite is true. All of these things are helpful. Welch’s perspective on depression is profoundly shaping and changing my own. BUT. What I really want to know is what to do about the depression. The final chapters of Welch’s book are dedicated to a discussion of how to treat depression, and while Welch does not shy away from suggesting medication – he also offers other tactics. Primarily, he suggests three approaches: we must talk to our depression, we must practice hope and thankfulness, and we must seek joy. I couldn’t agree more – if I know anything, I know about being a fighter. Seek the Lord. Sounds nice. I know that we should seek God and read his Word and worship God regularly, and whether we feel like it or not. We should seek Him as a discipline. I understand discipline, the idea of doing something as a discipline. I’m a musician. I have spent hours upon hours upon hours practicing the viola (and violin, before that). I’ve practiced scales and shifting, arpeggios and harmonics, etudes and orchestral excerpts and sonatas and concertos. The discipline of practice became a habit, ingrained. In grad school, I was up early every morning, making coffee and playing scales with sleepy fingers, day after day, waking slowly as my fingers grew in strength and flexibility, as the birds outside started their own songs, as the smell of coffee infiltrated the air. The discipline of practicing is a daily discipline – a consistent return to the instrument. And it’s also a discipline of repetition – doing the right thing over and over and over until your body only remembers what is right. Welch encourages those struggling with depression to practice hope. That sounds nice. I could get into it, maybe. Practicing hope. There’s kind of a ring to it. But what, exactly, is practicing hope? Hope: to want something to happen or be true and think that it could happen or be true. So in order to practice hope, I need to practice believing that what I want could be true. I need to practice believing in God. I need to practice believing that the depression will lift. I need to practice believing that life is good, worth living. In the Old Testament, the Israelites built stone monuments to God (the whole story is in Joshua 4), to remember what He had done for them, and to remind the generations to come of His faithfulness. Have I built similar monuments to God? How can I “override my instincts,” as Welch writes, when I’m in the midst of depression, and remind myself of life’s goodness so that I can live in hope instead of hopelessness? What do you do? I do have these journals. 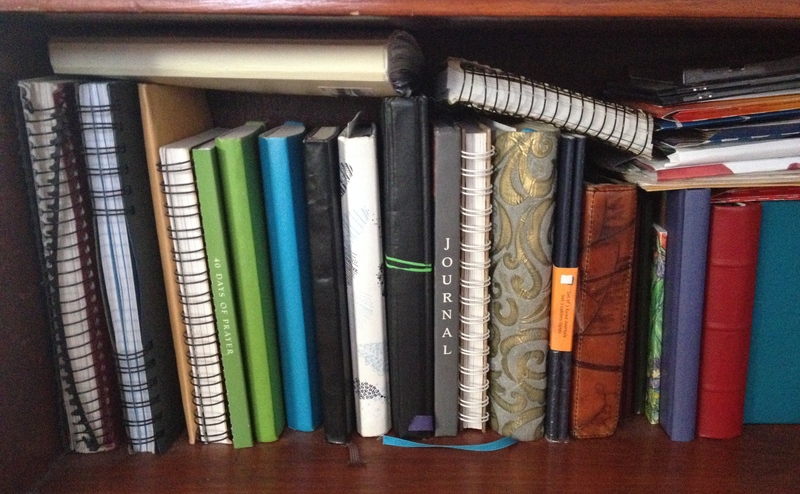 Shelves of journals. Records of my life, of my childhood dreams and vacations and meals (a source of endless teasing from my close family – “Leah, what did we each eat for dinner when we went to South Padre Island in 1989?” – because they know I’ve written it down). But also reminders of the other times of hopelessness, of darkness – and a reminder that each of those times ended. I have pictures. They are not beautiful or artsy or developed by hand in a darkroom, but they are pictures of happy times, of the people I love. I have people. It’s hard for me to reach out when I’m feeling bad. I’m an introvert, so it’s often hard for me to reach out even when I’m feeling good. I pep-talk myself into starting conversations with new people, hurriedly cross the street when I see someone I know but don’t feel like talking, and cling to my husband’s side at parties. But people help. I can make myself call my best friends. Then there’s music. Profoundly moving, soul-wrenching classical music like late Beethoven (I particularly recommend the String Quartets and Piano Sonatas) and the clean, pure lines of Bach (favorites are impossible but the Goldberg Variations is particularly cleansing. And the solo Violin Sonatas and Partitas will take you to another place). There’s the cheesy country music that I put on when I’m cleaning or when it’s 7:45am but still dark in the depth of winter and there’s whatever is on my current playlist of contemporary Christian favorites. There’s the female singer-songwriter I’m recently obsessed with. And there’s all the music that I need to resist when I’m already feeling bad. Finally, of course, there’s Scripture. There are the Psalms – filled with agony and beauty, with trust and disbelief, with cries out to God and songs of praise. Possibly no other book in the Bible is more human, more filled with raw emotion, more reflective of our earthly lives, desires, and brokenness. When I’m in a bad place, it’s hard for me to read Scripture, hard to listen to the music that I love, hard to talk to the people I love. It’s too easy to pray this kind of prayer: God, I feel crummy. Please help me. I’m tired of feeling crummy. It’s not fair that I have to feel this crummy, and live like this, and for so long. I don’t know if I can do this any longer. It’s hard to believe that you’re even there. My prayers are whiny and demanding and certainly not glorifying or trusting. And in my prayers, I am waiting. I am waiting to feel better, waiting for comfort and ease. I am waiting for God to lift me up, to take away the bad and replace it with good, to give me faith. But I’m not practicing hope. Are you practicing hope? Can we start, together?